When Julián Castro, the United States secretary of housing and urban development, graduated from Stanford University in 1996, he had about $18,000 in debt. Now, he’s voting for Hillary Clinton in part because of her plans to make college more affordable and reduce student debt. 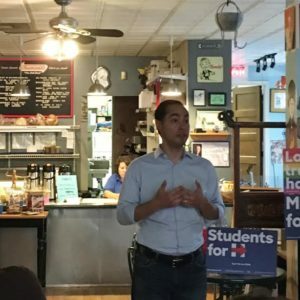 Castro explained why he believes Clinton should be president when he spoke to Lehigh students and members of the community at Deja Brew in South Bethlehem this afternoon. He said she is the best candidate to ensure Americans are safe in a “dangerous world,” and he emphasized the importance of her plans to create educational opportunities for students. “It’s all about, for this generation, who is going to create great opportunity in this country,” Castro said. Clinton’s plan would make community college free, make in-state public universities and colleges tuition free for students from families with an income less than $125,000 a year, and allow students to refinance their debt. Jigar Patel, ’17, attended the event and said he supports Clinton mainly because he is concerned about the soaring cost of college, which continues to rise faster than inflation. Patel, who is the president of College Democrats, said he was excited to hear why Castro is voting for Clinton. Aside from Castro’s speech, Patel said he appreciated Castro’s friendliness and his ability to connect with the audience. Pennsylvania Democrats and Students for Hillary invited Castro to speak. Abdallah Fayyad, an organizer for the Democratic party in Pennsylvania, introduced Castro by noting the importance of voting, especially for those who are between the ages of 18 and 24. Sophie Bysiewicz, ’18, attended the event because she is voting for Clinton, but also because she believes all Americans should be informed voters. Castro echoed this sentiment and challenged students to encourage others to vote. He said when students vote, they send a message to the president and Congress to improve the education system in the country. Castro said students need to spend the 17 days until the election encouraging as many people to vote for Clinton as possible. Students need to understand that Hillary Clinton represents the worst example of political favoritism and pay to play politics that needs to be destroyed in Washington. Her answer to everything is for the federal government to grab more power and make everyone beholden to government to insure democrats get reelected. Her free college gimmick is more of the same and totally unrealistic with a $20 trillion national debt created by Obama. Every initiative of hers as Scy of State was a failure including backing the Muslim Brotherhood in Egypt and wasting American Lives in Libya by not responding to the call then lie about it. Listen to the voices of secret service agents that have worked for her about her irrational behavior and behind the scene tirades. Don’t fall for the free stuff spewed by Clinton–She should be in jail vs on the campaign trail.